Hi all, I see little activity in the sharing of savegames and how people play the game. I wanted to make a contribution to the community by showing a save of mine. By saving progress every day of playing, I get a nice time line of the map. This save is from 1940 to 1965, where I'm contemplating leaving the game. The intention is to show a bit of how I play, tell a bit of a story and show how a few interesting points changed over the 25 years. My playing style is aimed to stay realistic, while retaining notions to create an efficient and direct network. Goods are generally left alone, because the advantages (read: complexities) of Experimental aren't as prominent in this area. Postal service is intended, but not necessarily vital for all services. The main focus is on passengers, coping with increases in ridership and network efficiencies. 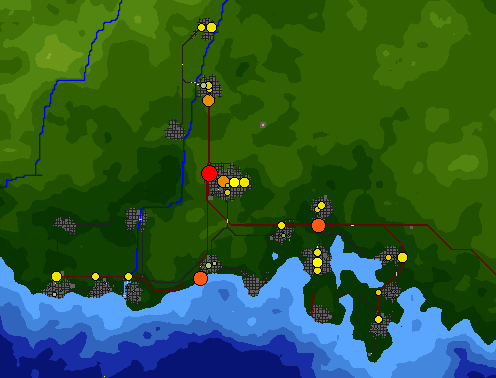 This leads to small towns with a few larger cities usually connected to clusters, but the population is spread out across the whole map. The terrain remained fairly flat, with a mountain range in the west and a large water body to make fast transport more of a challenge (the side-effect of ships helping much with profits was unintended but welcome). I stay off the public player as much as possible, only switching in to make minor changes (move attractions and help planning cities). 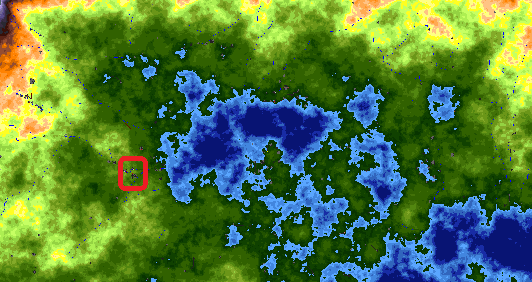 The size of the map is 4256 x 2256, seed is 1674679019, most map settings left untouched. 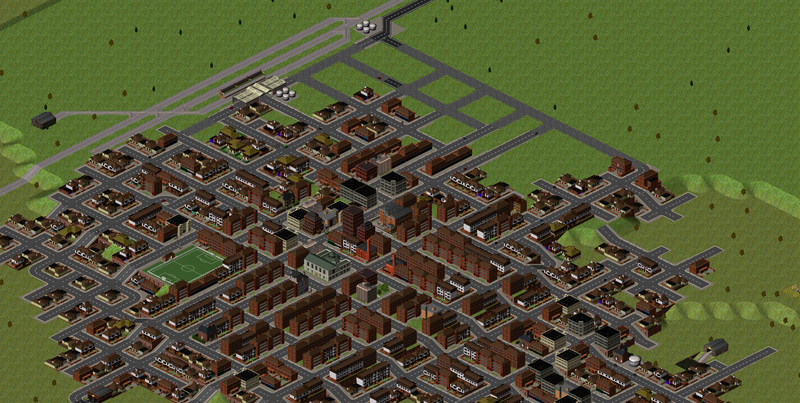 Played on Simutrans Experimental 11.35 with PakBritain 0.9.1 (only modification is correcting minor issues). The earliest save of the map shows a landscape scattered with many little cities disconnected from each other. We see a single track railway line in the west, connecting a group of towns with the north-west and the eastern-most settlement, Aylswich, down the river to the sea. Aylswich provides a vital service to bring passengers to Plumwich, the hub for the central city cluster and transfer point for travel to the north. There we see another railway service in its infancy connecting the third largest city (Yerlton) and its western coastal companions to the rest of the world. 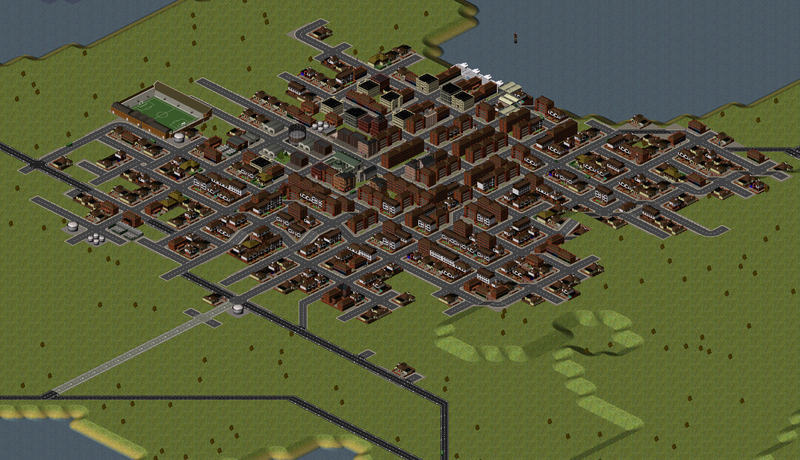 Isolated from all, the eastern city of Oldvale is served entirely by buses. There is one goods service moving crude oil from the south-east closer to the centre and petrol in return. I left this in because it didn't interfere with the line map. Oldvale and Cegwater Junction with their surroundings. All towns in the area (Oldvale aside) weigh in at around 3,000 to 4,000 people and are serviced entirely by one circular bus service around the large lake left and a service in shape of an L from Cegwater up north. Calcaster main station in December 1942. The early outline of the station is visible, along with the platform placement and main road access out routed above the station. Services north to Bigingham and east to the ferry are seen on the rails. Yerlton with station. The underground railway was an early project, with the depot visible on the right side of the image. The single line only moves few people, mainly down to the docks south. Plumwich. A few buses can be seen running the circular lines east of the city and at the football stadium the ones delving down the rest of the peninsula. The docks are close to maximum capacity, with the interchange of passengers happening there while a ferry starts its voyage to Aylswich. Two years later, the first longer distance line is opened. Yerlton and Oldvale are now reached with hourly trains that average above 100km/h. 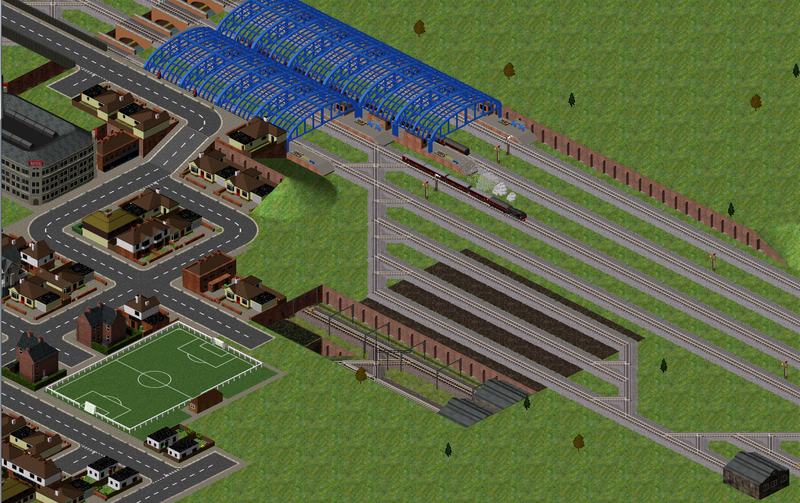 Other notable additions in the infrastructure include the construction of Oldvale's underground station and the construction of rails leading further east into Formere/Hexborne. The ferry services in the centre are showing profits equal to the entire company profits. Yerlton station with one of the new express trains from Oldvale. The left image shows the transfers being made, visualizing the overground railways serving the towns coastwards. The underground railway in Yerlton consists of one vehicle on the only line and is visible as it makes its (larger) stops in the dead centre of the image. Oldvale station. The shunting yards for the express and eastern-bound services are present, services to Ronhurst and Cudcester are present, and the first station buildings over ground are present to aid in the comfort of passengers changing trains. The image right, is a short timeline in the layout of tracks as more lines were created and routed via Oldvale Central Station. The last image is a sliced underground view to show the initial platform layout. The transfer station of the new extension in the East, with a train from Oldvale entering the station and another setting off in the opposite direction. The third train is the service coming from the South, newly assembled at this point and completing its second voyage. By June 1946, Yerlton has secured another vital connection. The East-North axis is complete and operated by further high-comfort and high-speed services. The service is timed to allow passengers to travel from Oldvale to Calcaster in 4:50hrs (a 506km, 105km/h average) journey. The single track layout brings many issues with slightly delayed trains and queues at stations on the line, which endanger the overall effectiveness of the network. 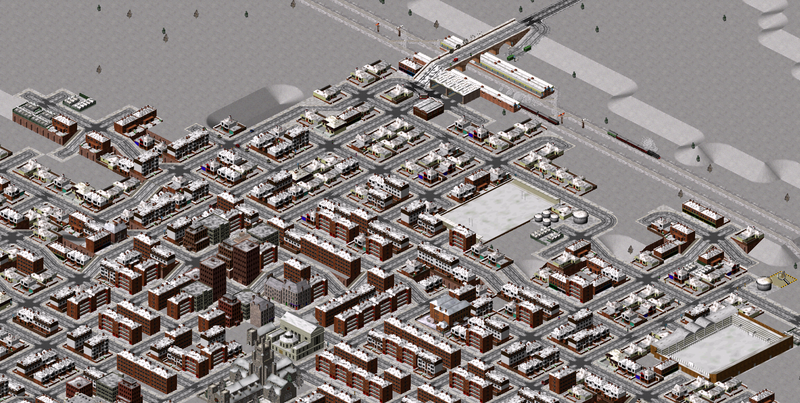 The city of Pewingley and its surrounding towns receive an extensive rail network. Yerlton station with sidings. Both trains facing the station are preparing to embark on their journeys East and West. Pewingley Northern Hub Station. A service South-East is leaving leaving and the new express for the East-North line is waiting for its moment to leave the station towards Milldon and ultimately Calcaster. South East of Pewingley, Wilton and Wele share a station. Bus services are not yet present, due to the connecting nature of the station. These slow progress updates are boring. I've made some gifs to illustrate the growth in network, the change in Calcaster Station's layout over time and the three levels of the map's busiest hub Plumwich. 1. The change in network over time. Most individual snapshots are two years apart, with deviations towards the middle. 2. Calcaster Station was intended to be the first large hub and underwent many changes in its lifespan. Initially it was perfectly adept with three platforms and some shunting yards to give way for more lines. But it was limited in width due to the its position between the hill and the city (and my intention to keep things moderately realistic). 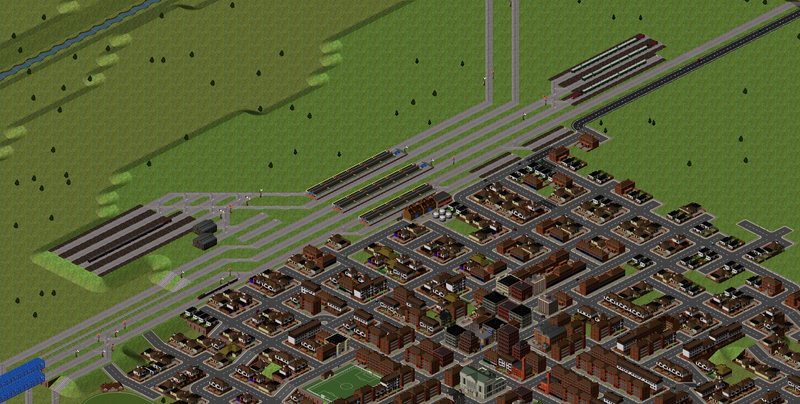 I increased shunting space as far as sensible, even considered making a loop around the north and running most services using the tracks to the East one-way. The entry to the shunting yards was moved underground to avoid trains having to reverse, sparking my idea. The best solution, allowing for a proper split in the rails leading East and North, was to relay the high-speed services (via Centre/Plumwich area) to new lower platforms which ease the pressure on the switch pictured here. Some pictures show the gridlock often present.